NOTE: Special Date – Due to Thanksgiving, the “November” meeting will take place on December 2nd. 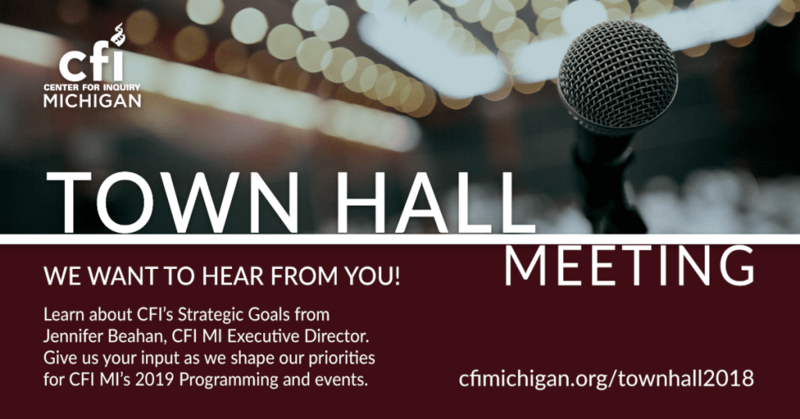 Join us for a special Town Hall style meeting at this month’s Café Inquiry in Livonia to learn about CFI’s Strategic Goals with Jennifer Beahan, CFI Michigan’s Executive Director. After a brief overview these goals, and a snapshot of the current “State of the Center,” Jennifer will facilitate a discussion with attendees to get feedback about event and programming ideas, and to listen to your suggestions, concerns, and questions regarding CFI’s mission and programming.